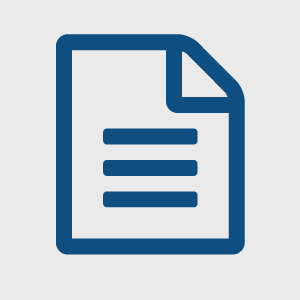 The Text (T) category includes every written document produced, created and used during, and for, all the 24 Pure Research projects. 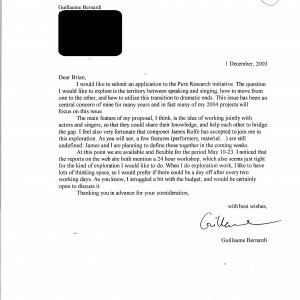 These documents served as part of the application and creation of the proposals for the research, as research material, and as the product of the experiments done during the workshops. 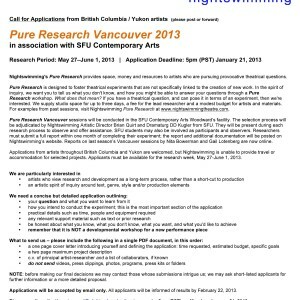 Pure Research 2013 call for submissions. 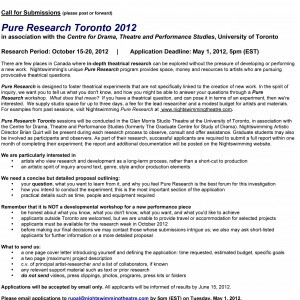 Pure Research 2012 call for submissions. 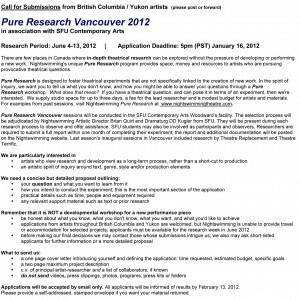 Pure Research 2011 call for submissions. 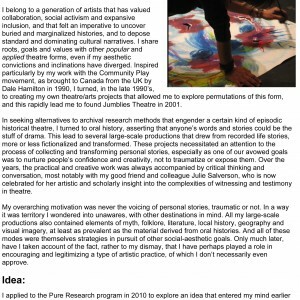 Pure Research 2010 call for submissions. 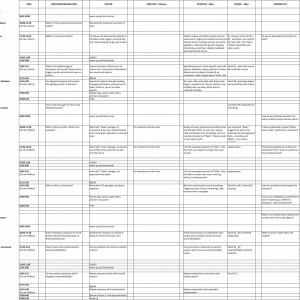 Table of the activities for the workshop. 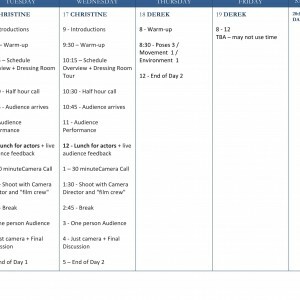 First draft of the schedule for the 3-day workshop. 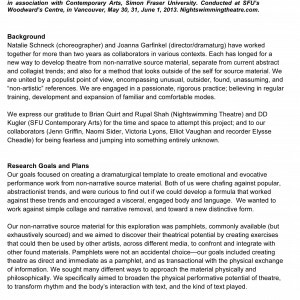 Revised research proposal sent after the application submission. 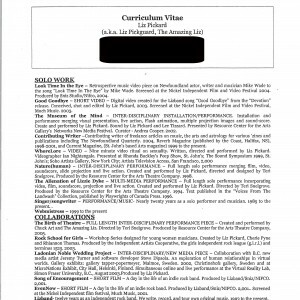 Application Letter, Project Description and Resume. 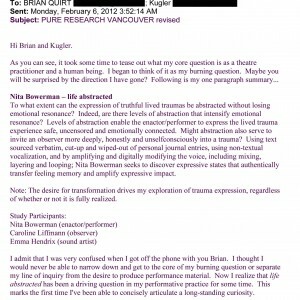 Kathryn Ricketts´ Pure Research application letter, project description, and resume. 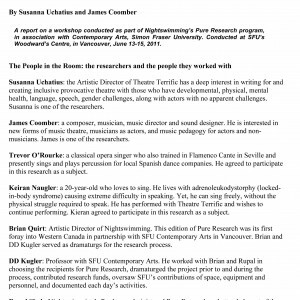 List of students that participated in the workshop. 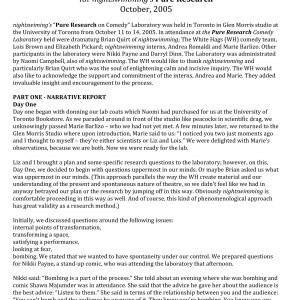 Gail Lotenberg´s Pure Research project description. 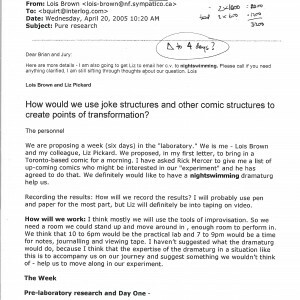 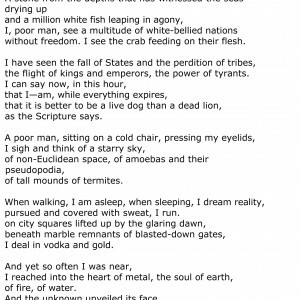 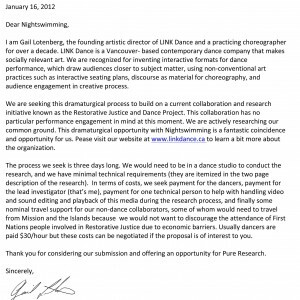 Gail Lotenberg´s application letter for Pure Research. 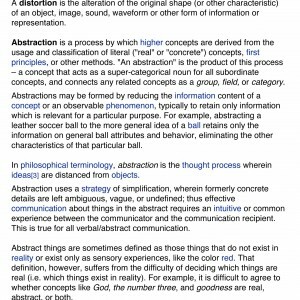 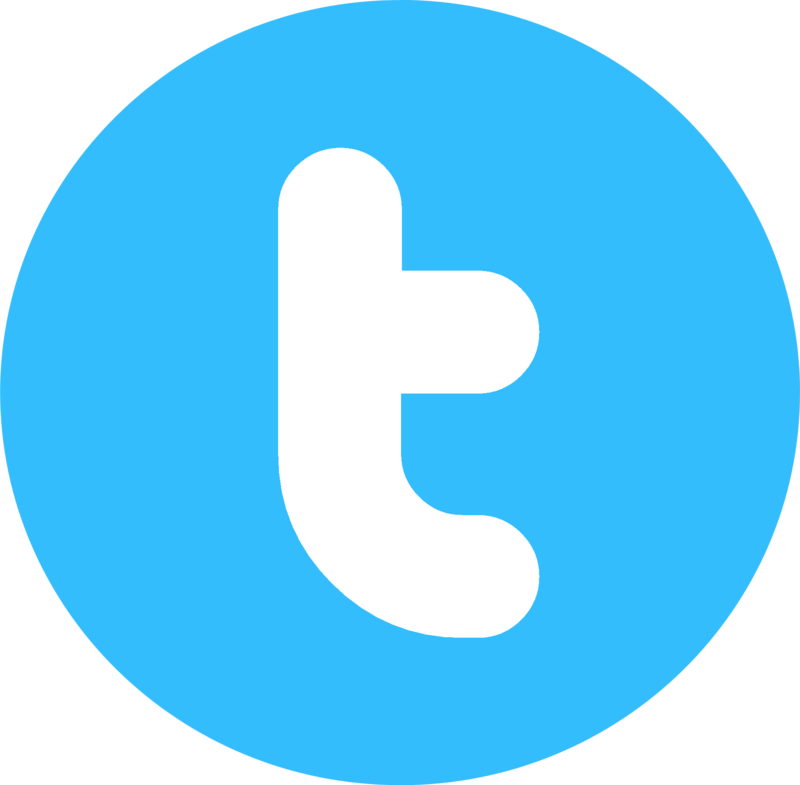 Definition and description of the words “distortion” and “abstraction”. 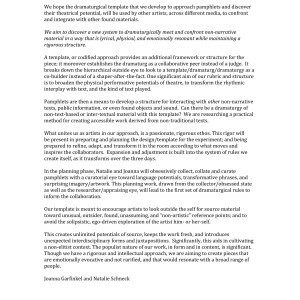 Text used for the experiments during the workshop. 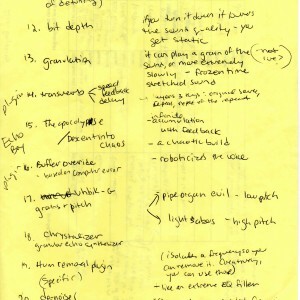 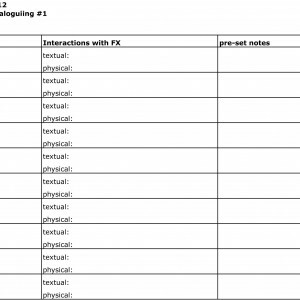 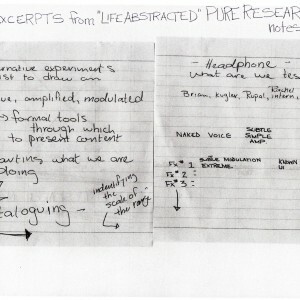 Nita Bowerman´s notes on the experiments. 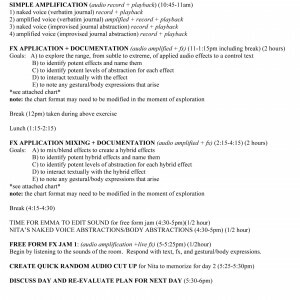 Charts used for collecting and cataloguing audio effects during the workshop. 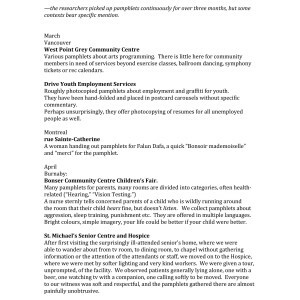 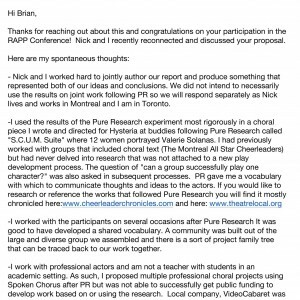 Additional report on the research project. 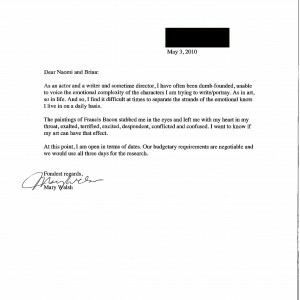 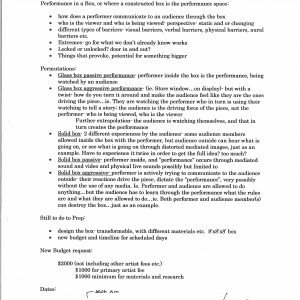 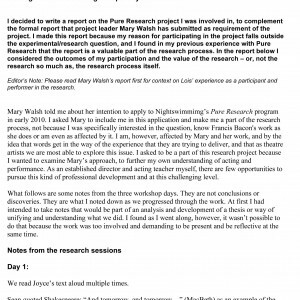 Mary Walsh´s Pure Research application letter, and project description. 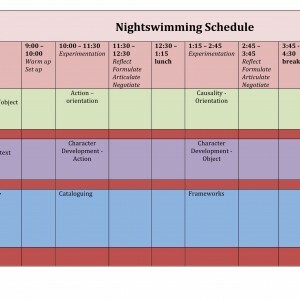 Detailed schedule for the 3-day workshop. 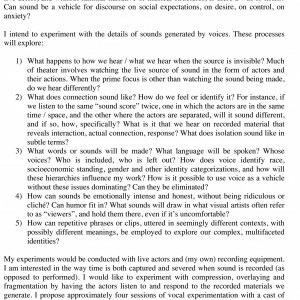 First draft of the experiments for the workshop. 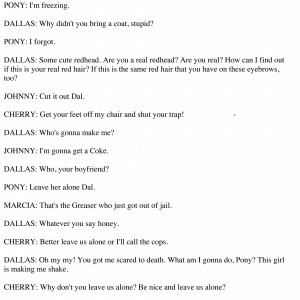 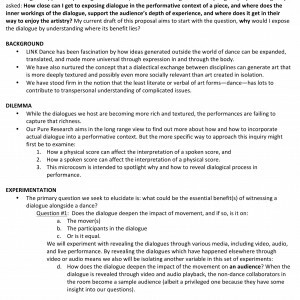 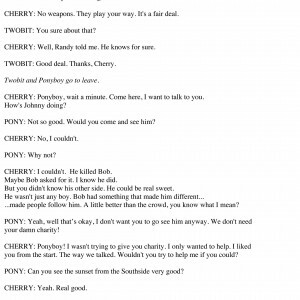 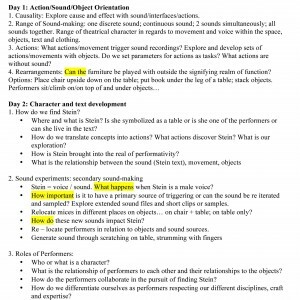 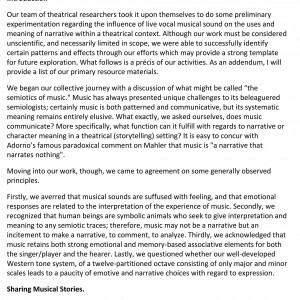 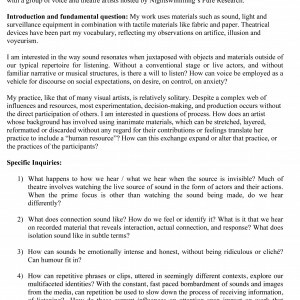 Revised research proposal in a conversation between Nita Bowerman and Brian Quirt. 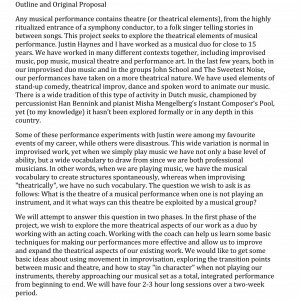 Application Letter, Project Description, and Resume. 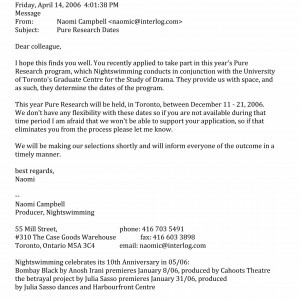 Nita Bowerman´s Pure Research application letter, project description, and resume. 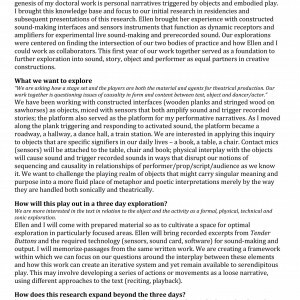 Susanna Uchatius´s reflections on the research workshop. 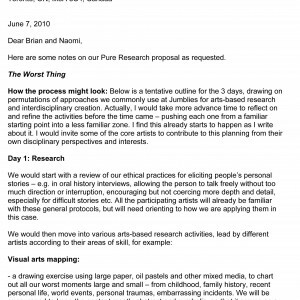 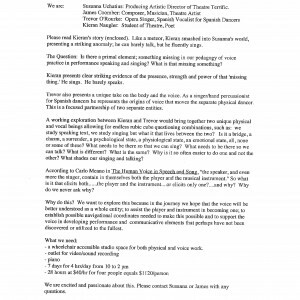 Susanna Uchatius and James Coomber´s Pure Research application letter, project description, and resume. 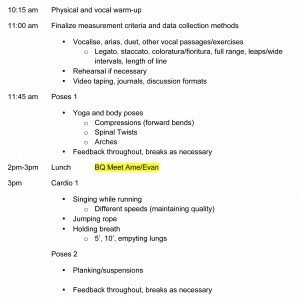 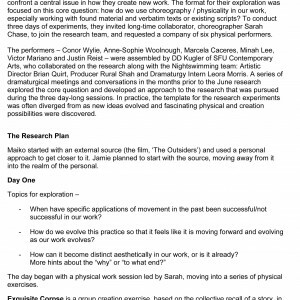 Draft of the workshop schedule. 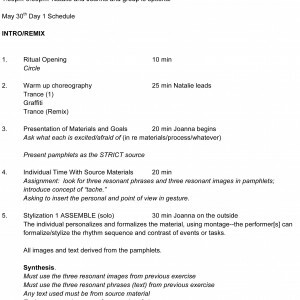 Short project proposal and schedule for day 1 of the workshop. 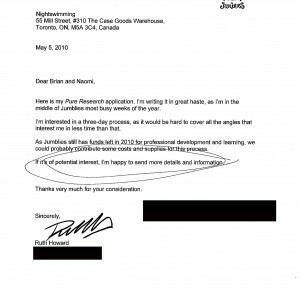 Derek Kwan´s Pure Research application letter, project description, and resume. 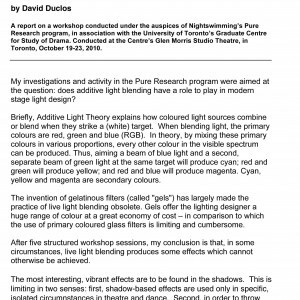 David Duclos´ Pure Research application letter, and project description. 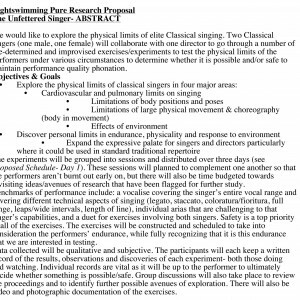 Specific details for the research proposal sent after the application. 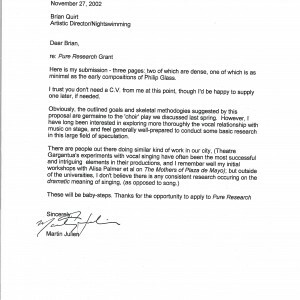 Ruth Howard´s Pure Research application letter, project description, and resume. 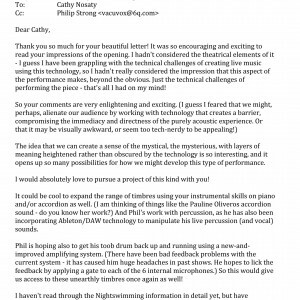 Nick Carpenter´s thoughts on the workshop 8 years later. 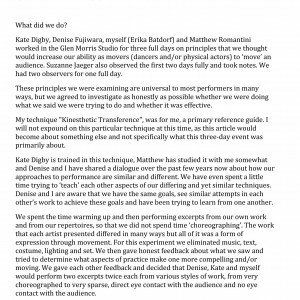 Rebecca Singh´s thoughts on the workshop 8 years later. 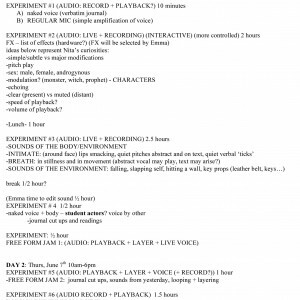 Script used for the experiments for the research. 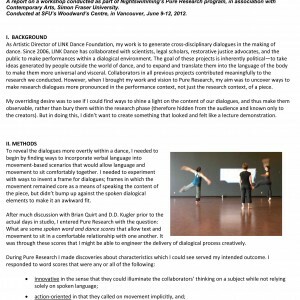 Guillaume Bernardi´s application letter and project description. 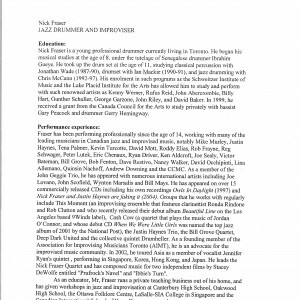 Nick Fraser´s bio and press. 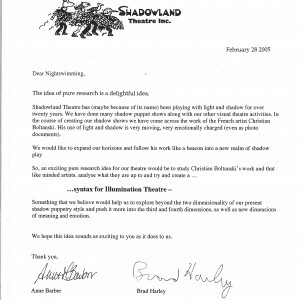 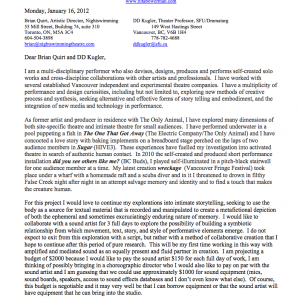 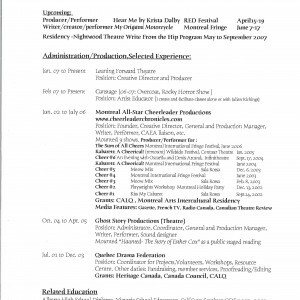 Nick Fraser´s application letter and project description. 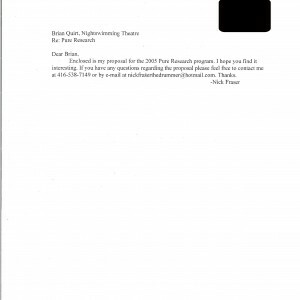 Letter with the revisited research proposal and details. 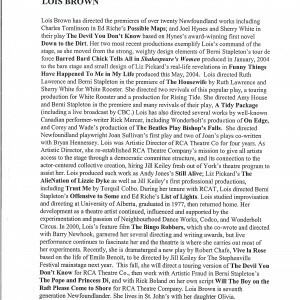 Lois Brown´s bio and resume. 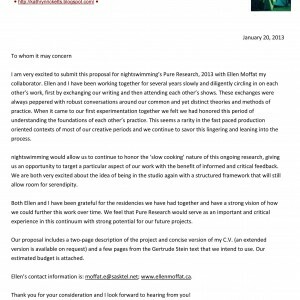 Revised research proposal and project details. 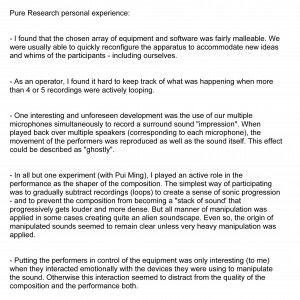 Camellia Koo´s Pure Research application letter, project description, and resumes. 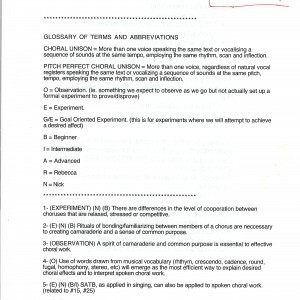 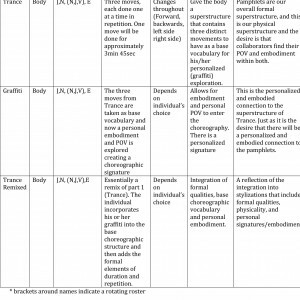 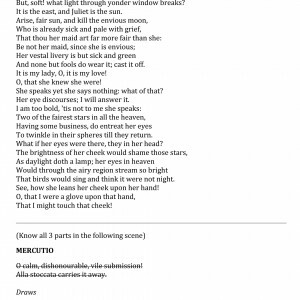 Glossary and description of the experiments for the workshop. 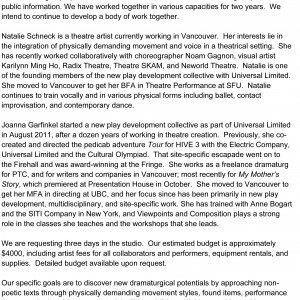 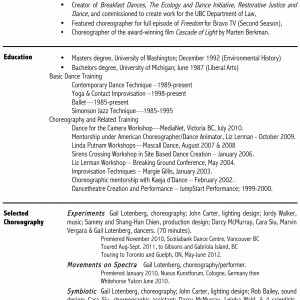 Rebecca Singh and Nick Carpenter´s resumes, and Njo Kong Kie´s bio. 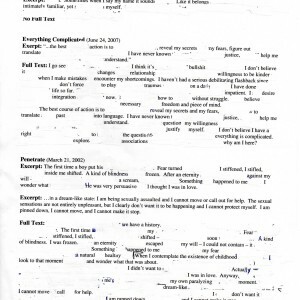 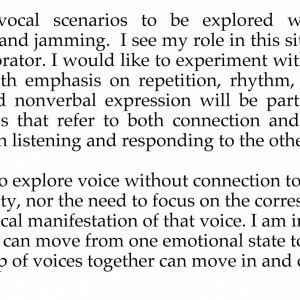 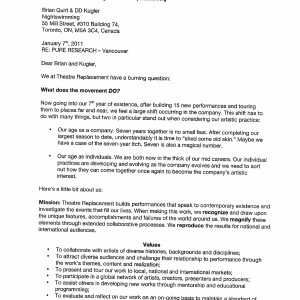 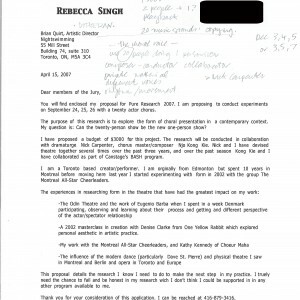 Rebecca Singh´s Pure Research application letter. 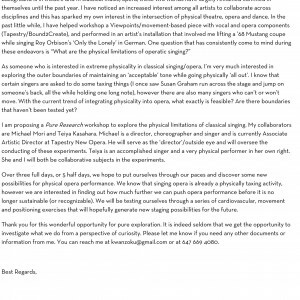 Letter sent by Heather Nicol to the artist participating in the research project. 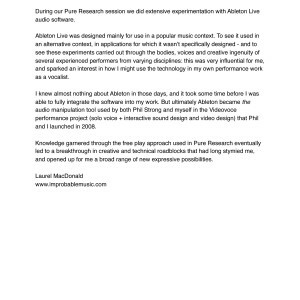 Heather Nicol´s Pure Research project description. 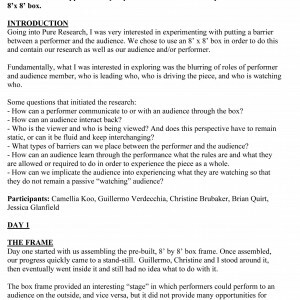 Laurel MacDonald´s reflections on the research workshop. 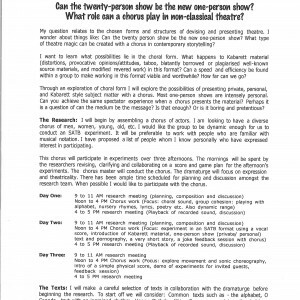 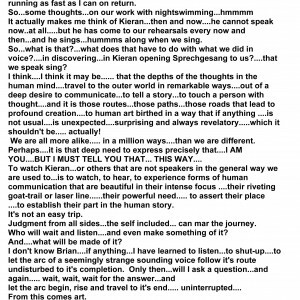 Philip Strong´s thoughts and observations written after the 3-day workshop. 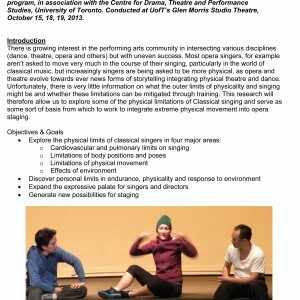 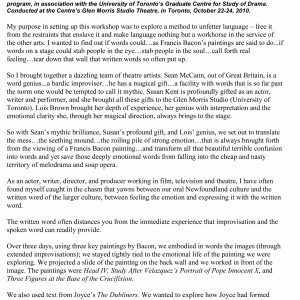 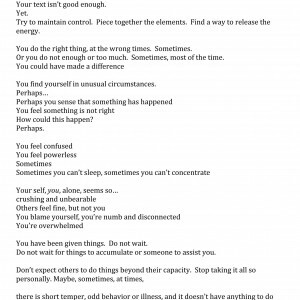 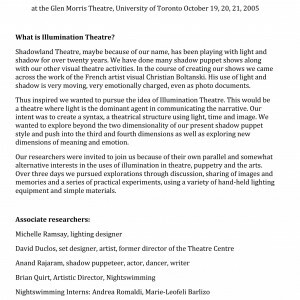 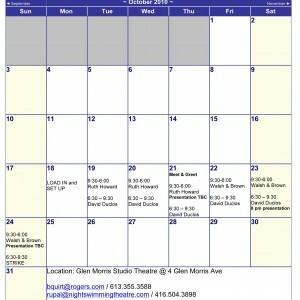 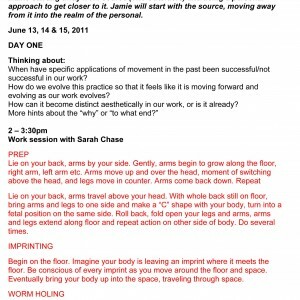 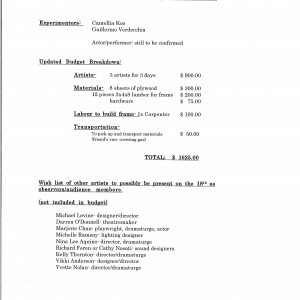 Email sent by Laurel MacDonald to the participating artists with the schedule for the workshop. 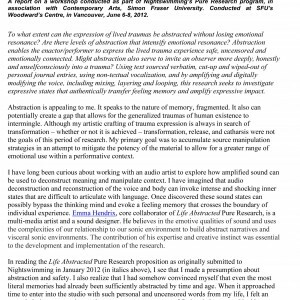 Letter sent by Laurel MacDonald to the artist participating in the research project. 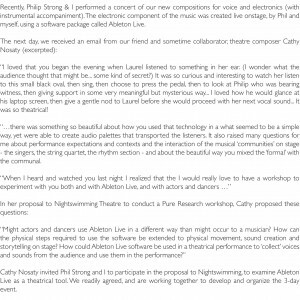 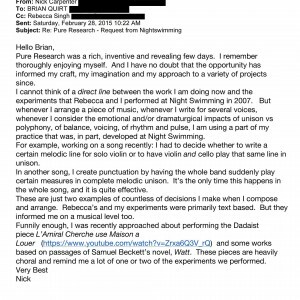 Email confirmation of Cathy Nosaty, Laurel MacDonald, and Philip Strong´s application submission from Nightswimming. 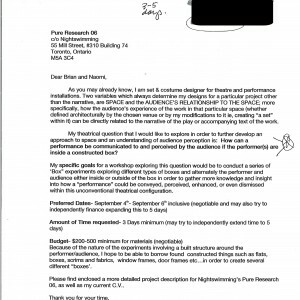 First draft application sent by Cathy Nosaty to Laurel MacDonald and Philip Strong. 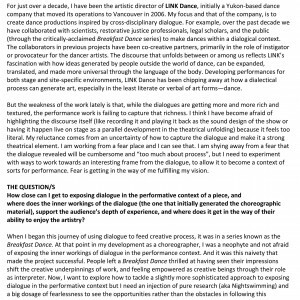 Laurel MacDonals´s response to Cathy Nosaty´s project proposal. 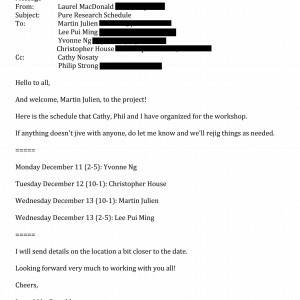 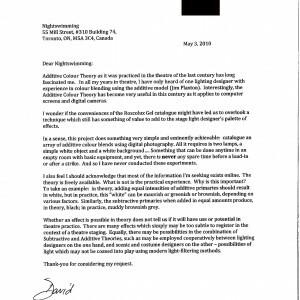 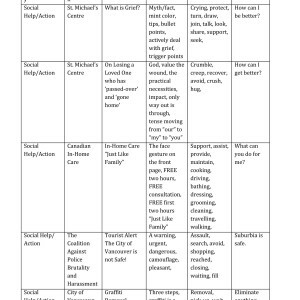 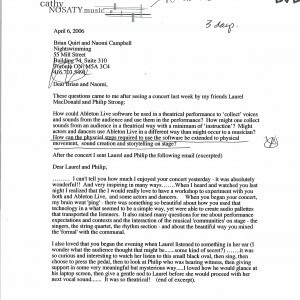 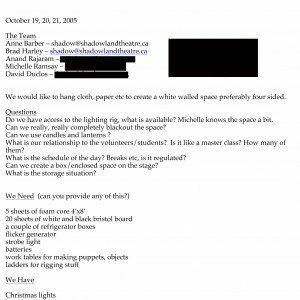 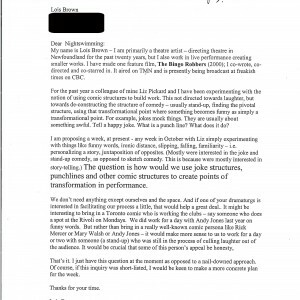 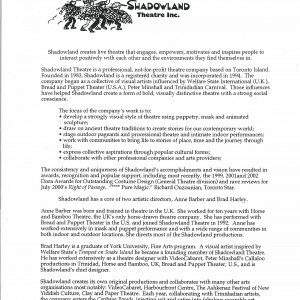 Email sent by Cathy Nosaty to Laurel MacDonald and Philip Strong with a project proposal. 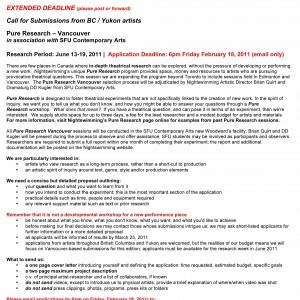 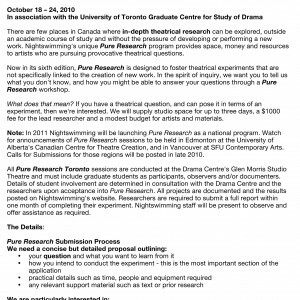 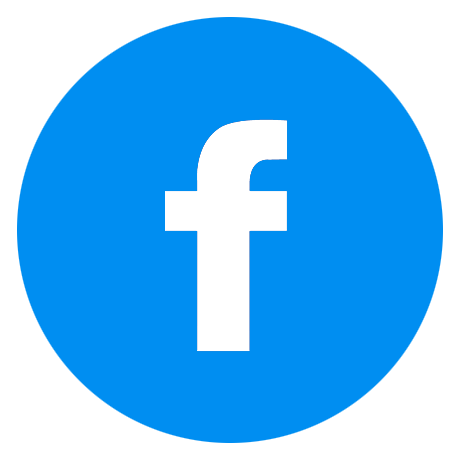 Cathy Nosaty, Laurel MacDonald, and Philip Strong´s Pure Research application letter, project description, and resumes.